Today I am very excited to finally share with you my new pattern, the Jeune twin set! I have been working on this skirt and top combination for over a month now and am very happy it is finally finished! I have had a lovely group of testers working behind the scenes making some beautiful Jeune tops and skirts...make sure to check out IG and the hashtag #jeunetwinset, #jeunepattern to see them all. You can purchase the PDF pattern HERE. Use JEUNERELEASE10 to receive 10% off for the next 48 hours only (expires 9pm AEST, 11/4/'18). 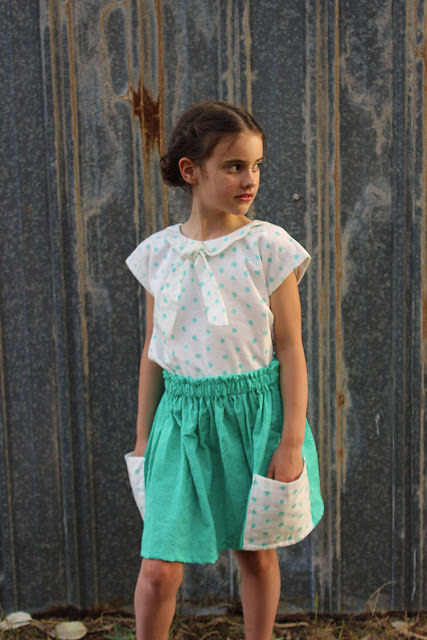 The Jeune twin set is a sweet vintage inspired top and skirt with simple details. The Jeune top features a round neckline at the front which can be accented with a half peter pan collar or tie collar. The short dolman sleeves sit over the shoulder. The back neckline can be made rounded or V shaped and the hemline of the top at the centre back can be made straight or angled. The top closes with buttons at the back. 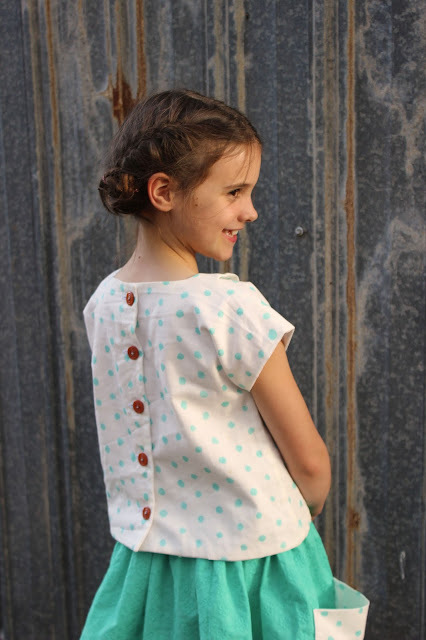 The Jeune top is fully lined and sits between the waist and hips. The Jeune skirt is a gathered skirt featuring an elasticised waist. Big patch pockets can be added over the side seams and are integrated into the hemline. Wear the top and skirt together or as separates. The top looks great both tucked in or left out. The Jeune twin set is perfect for the beginner sewer. Jeune is French for ‘young’ and inspired the name of this pattern. Oh and guess what? The Jeune twin set can also be made for dolls! The doll’s pattern was designed to fit Soft Cactus dolls. These dolls are 33cm (13”) tall, and are just beautiful! The perfect project for little sewers! Thank you to my testers, Anke, Annick, Audrey, Claudia, Daisy, Debora, Deborah, Fabienne, Guus, Jenya, Karyn, Katrien, Kristie, Maarika, Maria, Marjolein, Mijke, Qwinta, Rose and Tinne. You have been fantastic and so helpful! I can't wait to see what you do with the new pattern! Come back tomorrow for another Jeune twinset.